In The Raiser's Edge 7.92 or higher, there is a query type called Giving Score query. This is designed to help users analyze their Giving Score results and group constituents accordingly. 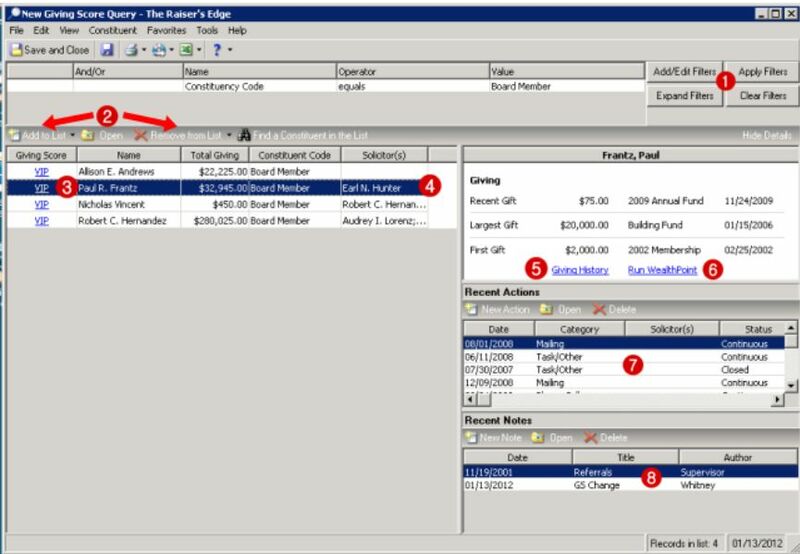 Giving Score queries allow you to create lists of your constituents to be used in other processes throughout the program, such as in mailings. The lists you create are based on the Giving Score ratings your constituents receive when your data is scored for the Giving Score through the Data Health Center, or when you manually assign a Giving Score. For example, if you start a campaign and want to send targeted mailings to your best donors, you can use a Giving Score query to create a list of all of your constituents who have a rating of VIP, and use that list for the mailing. A Giving Score query record is slightly different from other query types. Rather than containing four tabs from which to build your query and view its results, a Giving Score query record uses a list concept to create your query in one step, and then display your results on a single page. For example, you can create a Giving Score query that produces a list off all of constituents with a Giving Score rating of VIP. Then, you have the ability to add additional filters as needed (i.e. filter the list of VIPs to only show constituents with a constituency code of Board Member).